My Outside Voice: This just in. . . .he should have stayed in MN a little longer. . . This just in. . . .he should have stayed in MN a little longer. . .
How come he looks so much worse for wear than Jon Bon Jovi you wonder. . . .and why do you think they said a woman and two girls? The two girls were under 18 maybe? LAGUNA BEACH, California (AP) -- Bon Jovi's Richie Sambora has been arrested for investigation of driving under the influence of alcohol. The 48-year-old guitarist was arrested just before 11 p.m. Tuesday after an officer noticed his black Hummer weaving in traffic lanes, said Laguna Beach police Sgt. Jason Kravetz. Sambora was given field sobriety tests and arrested without incident. He was booked at the Laguna Beach jail and released at 4 a.m., Kravetz said Wednesday. "He was very cooperative with all the staff," Kravetz said. A woman and two girls were passengers in the car, said Kravetz, who declined to release their names. 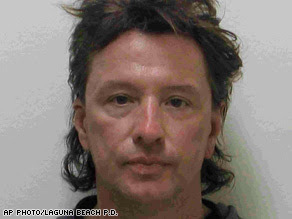 Sambora was given notice to appear in court May 7 on one misdemeanor count of driving under the influence, Kravetz said. Ken Sunshine, a spokesman for Bon Jovi, had no comment. he creeps me out -- and in this photo he looks like that guy from nin and a half weeks... can't remember his name! When I heard "woman & 2 girls" I immediately thought Denise Richard & her 2 daughters...or is that totally over? I'm with Kate - I think it's probably "Best Friend OF The Year" Denise Richards and her two girls.